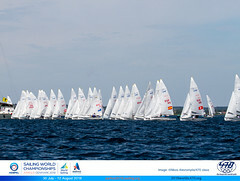 Stunning racing conditions on day 2 at the 2015 470 Open European Championships in Aarhus, Denmark wrapped up the qualification series. The breeze ranged between 6 to 10 knots, swinging round, to keep teams on their toes. From Wednesday 1 July, teams will race in gold and silver fleets for the 6-race final series. Another inspirational day of racing from Gil Cohen/Danielle Maman (ISR) sees them hold firm at the front of the 470 Women fleet. A short lived dip to 2nd on the leaderboard for Stuart McNay/David Hughes (USA), as Russia’s Pavel Sozykin/Denis Gribanov overtook, was soon reversed by a strong third place finish in race 5 and the pair end qualification holding the yellow leader bibs. 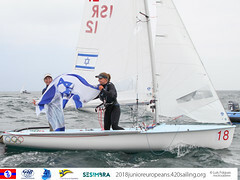 Faced with another day of tricky and shifty conditions, Israel's Gil Cohen/Danielle Maman proved yesterday's hat-trick performance was no one-off, as they opened their attack on the 470 women's yellow fleet with another win in race 4. All change in race 5, with unpredictable shifts forcing them down the pack, as they mis-read the breeze to finish in 21st. The win went to Ai Kondo Yoshida/Miho Yoshioka (JPN) who claimed the lead from the first upwind. For the Japanese pair, the 470 Europeans marks Japan’s second and final selection event to decide the team going to Rio 2016. Kondo/Yoshioka secured Japan’s place at the Olympics from their 8th place result at last year’s ISAF Worlds and now it is mission on to secure a third Olympic appearance for Kondo, following on from Beijing 2008 and London 2012. Already, Japan’s next generation of 470 sailors is making their mark as they pace the path to Tokyo 2020. The pairing of Akiyo Yamaguchi/Eri Hatayama have posted an all top-10 scoreline so far and sit in third overall. Blue fleet victories to Jo Aleh/Polly Powrie (NZL) in race 4 and Annie Haeger/Briana Provancha (USA) in race 5, keeps them both well inside the top 10 as they look ahead to the first day of gold fleet racing tomorrow. Qualifying in the 24th cut-off place and on tiebreak advantage, were Spain’s Sofia Toro/Laura Sarasola. Toro won gold at the 2012 Olympics in the match racing event, and she along with her then match racing partner, Angela Pumariega both made the transition to helming a 470. They now face each other as they strive to qualify Spain and themselves to Rio 2016. The 470 Women fleet will see 24 teams in the gold fleet and 23 in the silver fleet for the 6-race final series, with the top 10 gold fleet teams advancing to the Medal Race on Saturday 4 July. An intense three race day for the 470 Men gave plenty of opportunity for leaderboard changes. As the discard kicked in after race 3, a scramble to first overall for Pavel Sozykin/Denis Gribanov (RUS) who counted two race wins, but the USA’s Stuart McNay/David Hughes were back on top by the end of the day. Six races to win, six different winners, presented a real depth of talent showcase, with numerous teams able to make their mark at the front. In the blue fleet, defending 470 European Champions, Luke Patience/Elliot Willis took out the opening win of the day, followed by Changiu Kim/Jihoon Kim (KOR) in race 4. Rounding out the day Portugal’s Antonio Rosa/Joao Rosa claimed their win, a performance best for the partnership at a 470 Championship. 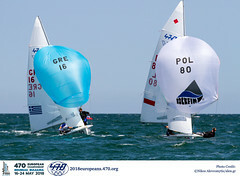 In the yellow fleet, Pavel Sozyskin/Denis Gribanov (RUS) claimed race 3, with team mates Mikhail Sheremetyev/MaksimSheremetyev (RUS) sealing the race 4 victory, and Panagiotis Mantis/Pavlos Kagialis ending their day with a win. As the frontrunners consolidated their position on the leaderboard, the battle was in full swing further back in the fleet as teams jostled to secure their place in the top thirty gold fleet cut. The last team to qualify were Yannick Brachli/Hauser Romuald (SUI) on tie break over Hippolyte Machetti/Sidoine Dantes (FRA). An impressive performance for the young French team who only last year finished 2nd at the 420 World Championships and closed their 420 career with a gold medal at the 420 Junior European Championships. Although they were unaware of their precarious leaderboard position out on the water, South Africa’s Asenathi Jim/Alex Burger were in the critical 30th spot going into race 5, but they delivered to plan and advanced through in 27th overall. Asenathi’s usual crew Roger Hudson, has swapped his crew role for coach as Asenathi and Alex Burger, normally his sparring partner, warm-up for the 470 Junior Worlds. “For Alex to come and experience this level of racing amongst the world’s top sailors is great. It is also really interesting for me to have him on board and share the experience and giving his input about the racing,” explained Asenathi. “We are also getting a lot of feedback from Roger and we are able to learn together for the future. The South Africans are racing their first major event together, and a warm-up for the 470 Junior Worlds in a few weeks’ time. A relaxed Burger explained their expectations were high, but they were not under pressure. “We came into this regatta with almost no pressure, as if we didn’t perform it was our first regatta. And if we did, it would be fortunate. We kept a very open mind to the whole thing. "It’s very humbling, seeing how good people are,” Burger continued. “You read about them in the media and you see their results, but to actually come here and seem them sail is very fascinating. You get to see what the real deal is and what the level’s really at and where you need to be to compete in future generations to be competitive and look at a potential good finish at the Olympics. It’s very cool and really interesting watching them. There’s so much to learn." With just 30 days experience in a 470 together, Mexico’s Jeronimo Cervantes/Andur Belausteguigoitia are proving the worth of transferable skills. An 8th in race 5 has shown these two former Laser sailors that their mastery in the Laser Class is accelerating their learning in the 470. The 470 Men fleet are now split into gold and silver fleets, with 30 teams in each for the 6-race final series, with the top 10 gold fleet teams advancing to the Medal Race on Saturday 4 July. Nations represented at the 2015 470 Open European Championships are: Argentina, Australia, Austria, Belgium, Canada, Croatia, Denmark, Estonia, Finland, France, Great Britain, Germany, Greece, Hungary, Israel, Italy, Japan, Korea, Mexico, Netherlands, New Zealand, Poland, Portugal, Russia, Slovenia, South Africa, Spain, Switzerland, Sweden, Turkey, United States. The 2015 470 Open European Championships is organized by Aarhus Municipality in co-operation with Aarhus Sailing, the Danish Sailing Association and the International 470 Class Association, at the same venue which will play host to the 2018 ISAF Sailing World Championships. The racing format is an 11 race series scheduled for the 470 Men and 470 Women fleets, with 5 qualifying series races and 6 final series races. The top 10 teams will then advance to the final Medal Race on Saturday 4 July 2015.